The history of thought and the history of music are not the same. While thoughts always require adjectives to qualify them and yet are immune to the effect of such qualifications; the adjectives that apply to music are in most of the cases pre-ordained: Thoughts might be beautiful, haunting, dazzling, innovative, imperative, and ugly; but music is expected to be always beautiful. But there are no unifying criteria to judge what beautiful music is today or not, and this beauty often refers to a psychological effect more than to observable aesthetic qualities. Musical sounds and thoughts do have in common that they are offered in a temporal succession of articulations similar to that of languages, but neither are languages. Sounds however, are not driven by the logic of a concept, and the meaning – if there is one – cannot be inferred from a system of signs alone like alphabets; whatever the music says is not abstracted from music sheets and cannot be experienced, except as the music is being performed. The minimalist composer Philip Glass expressed it as: “The best music is experienced as one event, without start or end”. There’s a history of thought – erroneously associated with philosophy, for there are many different types of thoughts – that builds up historically as in stages, but the history of music is an intellectual constellation because the raw material of music, and of the minimal and most abstract musical sign – the beat – is something actually very physical, the sound available in nature and it could be said that it has always existed, in one form or another. It could be said also that human wisdom was there, albeit unexpressed, since the beginning of time, but the frequent repelling of natural laws and constant state of war, permits here a musical metaphor: Music that is not performed is like no music at all. The history of music then is not a history of concepts alone but a history of how music was performed throughout the ages – the history of music reception and the criticism of taste came rather late in the modern age –; thus it could be safely assume that traveling in time is easier for musicians than it is for thinkers. Time travel is precisely what Malek Jandali, a Syrian pianist and composer born in Germany, offers us time and again through his work, but unlike traditionalists embedded with nostalgia and romanticism in a musical style of another age; what Jandali offers us is travel through time into the most distant past and from there, all the way into the present. Jandali was born in Germany in 1972 and grew up in the now besieged town of Homs, then studying at the Arab Conservatory of Music in Damascus and in the United States. Far from being a classical musician in the strictest sense, his compositions range from solo instruments to ensembles and orchestral works. He has experimented also with a variety of formats, including live and acoustic performances, music for corporate multimedia, video presentations, commercials, film scores, television programs and documentaries. His career as a composer however begins in the 14th century BC: His album “Echoes from Ugarit” (2009) comprises a variety of original compositions for piano and orchestra recorded with the Russian Philharmonic Orchestra, arranged in the world’s oldest notation – that of Ugarit. Ugarit was an ancient port city – roughly located around present Ras Shamra, near Latakia – dating back to the 2nd millennium and first mentioned in the documents of Ebla, home to an ancient civilization that preceded the ancient cultures of the Middle East – in a world of Hittites, Sumerians, Hurrians, Hattians and Urarteans; going back to the 3rd millennium – and that is known to have been a human settlement for over 8000 years, perhaps one of the oldest in the region, with the exception of Jericho. The city had remained forgotten until the early 20th century when it was accidentally discovered and it is now known about the diplomatic ties between Ugarit and Egypt: In the remains of the city have been found carnelian beads, stelas and statuettes from Pharaoh Senusiet I, Senusiet III and Amenehmet III. The Amarna letters – an ancient Wikileaks, revealing information about Egypt’s diplomacy around 1350 BC – contained also letters from Ugarit kings Ammitamru I and Niqmaddu II. The imminent destruction of Ugarit resembles not without irony the fate of Jandali’s own nearby Homs as of today: Around the year 1190 BC, Ugarit king Ammurapi sent a letter to the King of Cyprus, stressing the seriousness of a crisis followed by an invasion at the hands mysterious foreign agents called “sea peoples” – “apiru” in the local language, and once linked to the Hebrews but without any scholarly basis – and asked for immediate assistance. The help never arrived and the city was burnt down to ground at the end of the Bronze Age. To this very day, the identity of the “sea peoples” has never been unearthed and conspiracy theories about them have been abundant through the ages. The work of Jandali from “Echoes of Ugarit” is based and inspired on the “Hurrian Songs”, a collection of music written on cuneiform clay tablets excavated from Ugarit, dating to around 1400 BC. One of these tablets contains a pagan poem, the Hurrian hymn to Nikkal; the oldest surviving work of notated music in the world surviving complete, together with fragments from other hymns. The tablet, found today at the National Museum of Damascus, contains the lyrics for a hymn, instructions for a singer accompanied by a type of lyre and instructions for tuning the harp. The notation refers to scales on a nine-string lyre with careful detail of intervals. 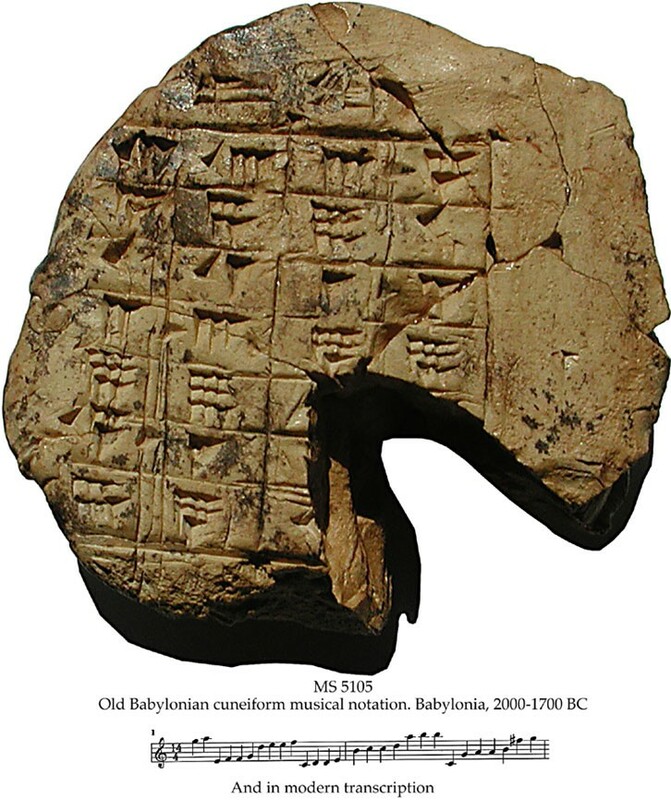 The text remains a matter of debate because the Hurrian language – unrelated to any Semitic tongue and vanished long before the golden periods of Babylon – has never been entirely deciphered, thus different hypothetical versions of the hymns are available and have been performed. In 2006, a work by “De Organographia” ensemble re-issued the record “Music of the Ancient Sumerians, Egyptians & Greeks”, including a varied repertory of Greek, Egyptian and Sumerian songs considered the oldest in the world, and featuring re-construction of instruments such as long-necked lutes, asymmetrical lyres and bronze bells. The work of Jandali however is not merely a performance of ancient song but the first appearance of a modern composer making use of the notation to compose a modern ensemble. The resources available to ancient composers seem very limited today and have to be incorporated into more developed schemes. As a composer of large works performed in Western style – that is, based on rhythm, harmony, counterpoint, chords and modulation; in half-notes of equal temperament on the chromatic scale – he incorporates also Arabic music: maqam modes that are monophonic modes based on melody, unlike Western music, but that are yet written in Western notation without having a fixed structure or meter, and their modulation is more of a melodic development. The pieces included in “Echoes from Ugarit” include a rhapsody (“Andalus”), Syrian folklore (“Sulaima”, “Eid”, “Arabesque”), classical pieces in E and G minor and the eccentric, atavistic and reflexive “Echoes from Ugarit”, performing the hymn to Nikkal in the ancient maqam modified to D minor. The latter might well be one of the most creative and original pieces in contemporary classical music. In 2011, the composer turned his attention to his home city of Homs and the Syrian uprising against Bashar Al-Assad. The city itself also bears an ancient past, geographically and historically close to Ugarit and was known also to the world of the Bible. The city was the site of the battle of Qadesh in 1274 BC, between the Egyptian and the Hittite empire, in what might have been the largest chariot battle in history. He composed the song “Watani Ana” (I am my homeland) that he was supposed to play at the annual convention of the American-Arab Anti-Discrimination Committee in June – a group with strong ties to Washington and to Syrian diplomats – and was finally prevented from performing. Though the reasons were not publicly discussed, the song while not mentioning Syria or Arab Spring, dealt with themes of freedom, martyrdom and suffering. A month later he performed the song in a protest across the White House and shortly thereafter, his parents were brutally attacked by regime forces back at home in Homs. The song was also made into a dramatic video clip by the Syrian American Council into a sort of montage, including images from all the countries involved in the Arab Spring – including Yemen and Bahrain – as a tribute to the struggle for freedom in the Arab world at large. Ibrahim Qashoush was a Syrian fireman and amateur poet that authored and sang songs mocking Bashar Al-Assad and coined the chant “Come on, Bashar, time to leave”. On July 4, 2011, Qashoush was found dead with his throat slit and his vocal cords ripped out. At the time he became the “nightingale of the revolution” and the chant became widespread among the massive protests and demonstrations that engulfed the country. In this work, Jandali is rendering a tribute to him. This work of music – a large scale ensemble with brooding but dramatic waves – was presented in a short film produced by Fugo Studios Film; the film while not a documentary deploys in the open all the metaphors of the Syrian revolution: the persecution, the burnt houses, the struggle for freedom, the resistance of the memory and the incredible power of art to reveal meaning without excluding further consideration. In a strong visual code – hardly metaphoric at that – musical instruments are destroyed by the ruthless authority, as Jandali himself hands instruments to young people to play what would be, hyperbolically speaking, a last performance before either freedom or death. Jandali’s apocalypse is always omnipresent – and can be read against the background of the great classical music of the European Romanticism, but he doesn’t submit to it completely. Music is not only about experience but also about analysis – but this is only available to the composer – and thus, the composer finds his way into the history of sounds by carefully studying and annotating the music the other virtuosos. But the performance of Jandali goes one step beyond, almost through the threshold between what is musical and what is literary and narrative. His music does not only please the ear and the senses. It also asks the question of Ugarit king Ammurapi to the King of Cyprus; he asks the world whether Homs will be burnt down, buried and forgotten the same way that once, the glorious Ugarit was.